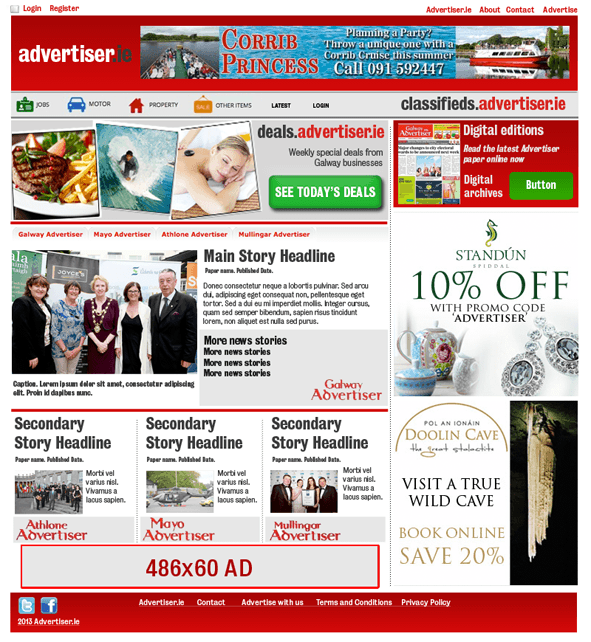 The website for the Galway Advertiser required a substantial update and refresh. Several new e-commerce products had been added to the company’s digital strategy. 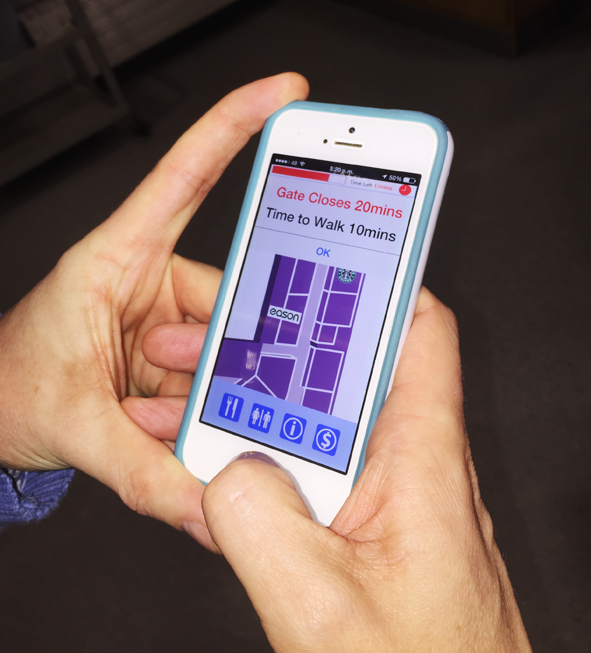 A new design was needed to help users navigate and interact with these additions. 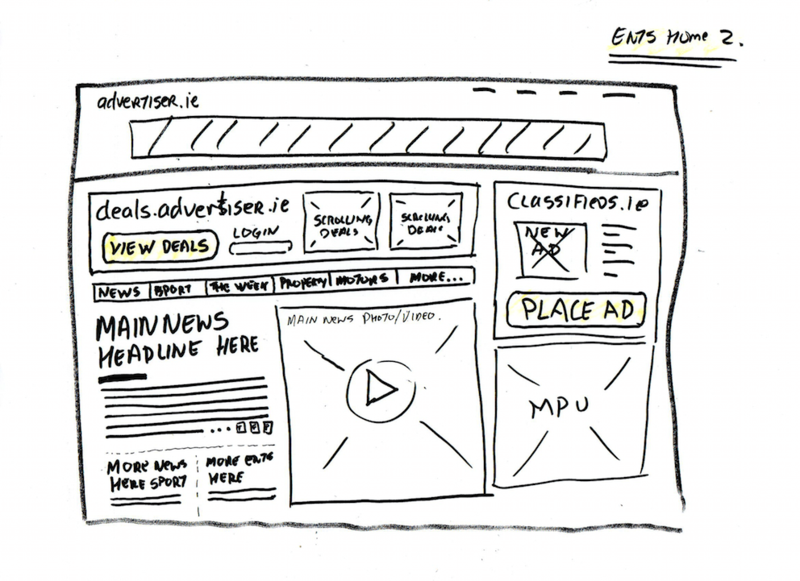 editorial content as well as new promotional spaces. The main business goal was to funnel traffic to new revenue streams including the Classified Ads and an online Deals website. I sketched some rough ideas highlighting the potential revenue areas important to the senior stakeholders. We had to find a balance between the competing interests of the newsroom and the sales office. This revision also needed to showcase new opportunities including video, audio and Social Media as well as additional display advertising. 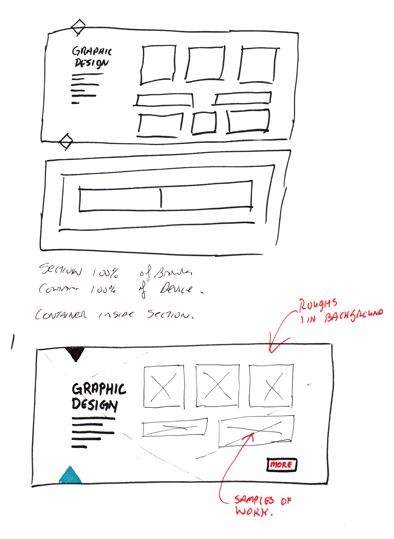 The initial sketches were converted into wire-frames to present to management to gain a consensus on the main layout decisions. 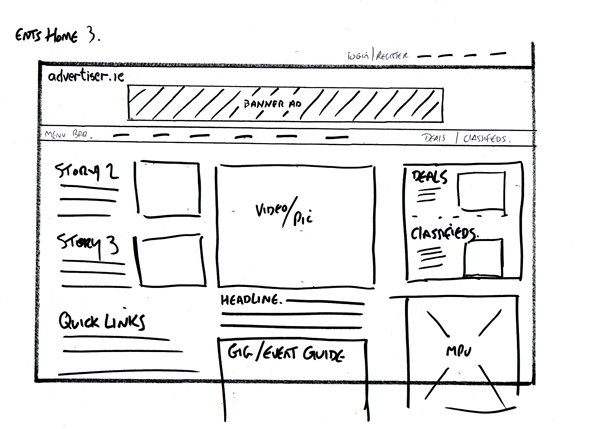 With limited development resources we had to resist pressure to jump forward and begin coding pages. 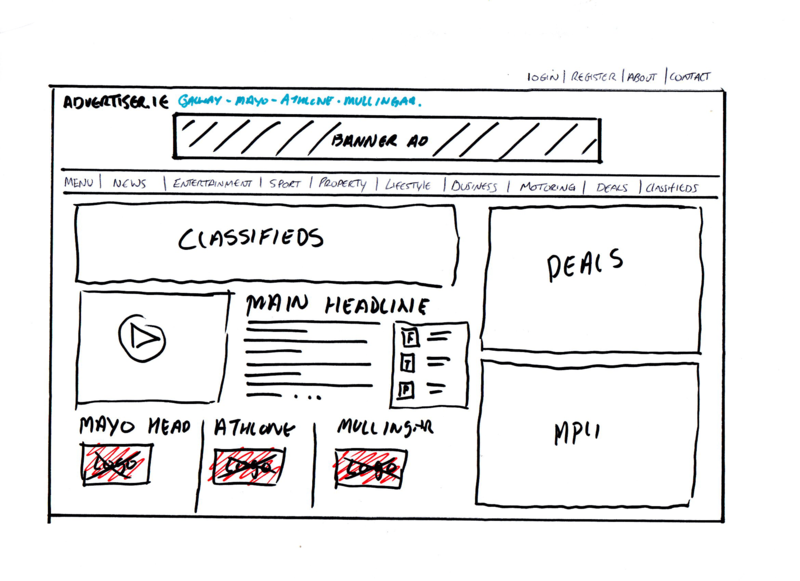 The interactive wireframes aided the presentation to stakeholders. 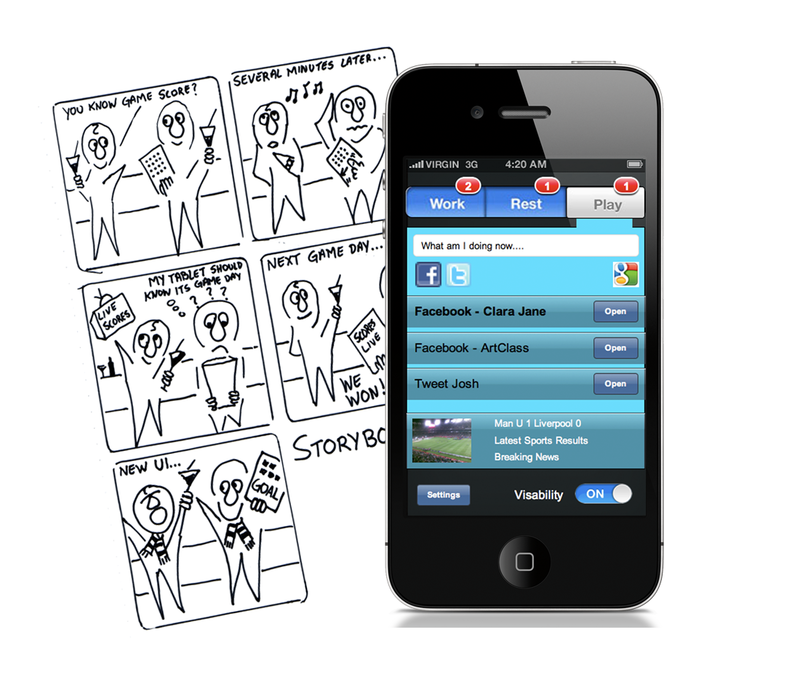 The final designs were then mocked up with Photoshop to communicate the visuals to our developer. The changes allow a more structured delivery of news, and promotion of the other products, as well as hosting innovations such as live property auctions. much more unified throughout the domain. 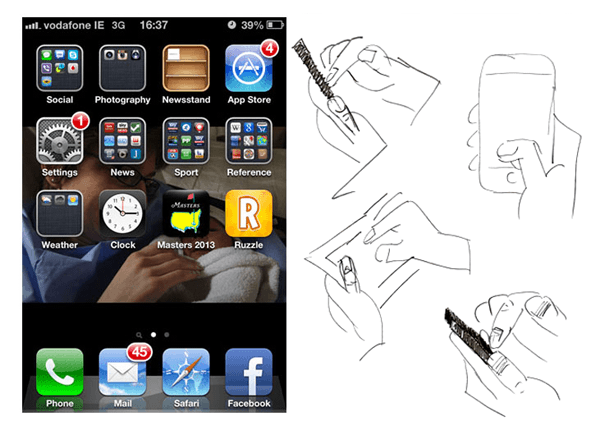 As part of the ‘HCI’ course on Coursera I developed a concept for an App called ’LiFE’. 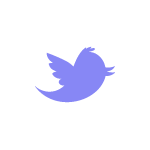 The app allows users to manage different social media, and other content streams in the one place. research and need-finding of ideas. and document any problems they encounter. and who in some cases have more than 100 Apps. Seeing how they struggle to organise these into subfolders I decided on a concept of displaying information from different Apps in one location. to help illustrate the problem and potential solutions. access specific information in a hurry. 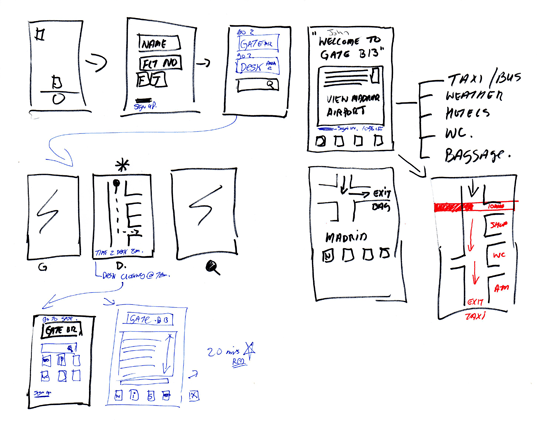 The ideas were rapidly prototyped using Balsamiq Mockups, and evaluated through the peer assessment setup on Coursera. 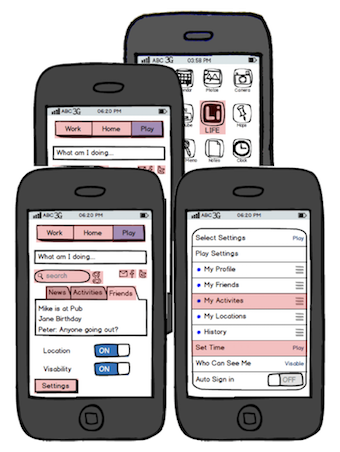 The final prototypes were created using Justinmind, prototyper and were then user tested with the results fed back into the assessment process. Final screens options being tested. 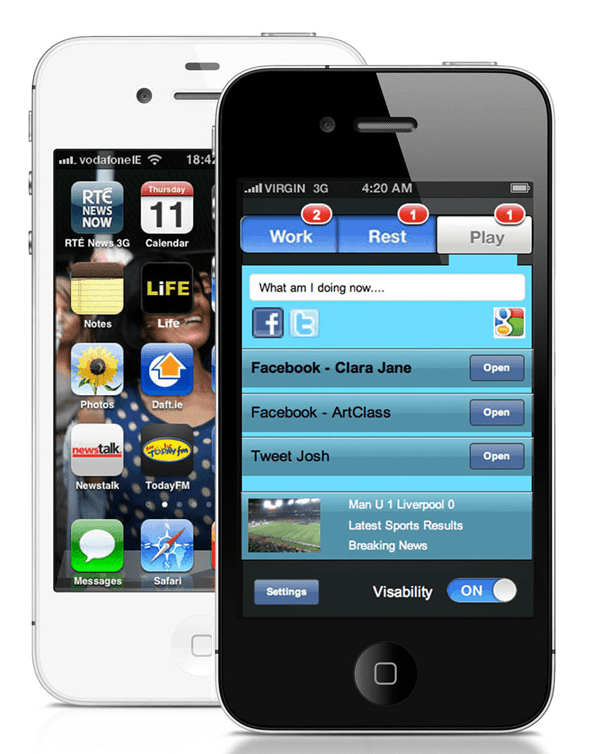 The LiFE app could help mobile device users quickly access social media, and personal updates. Play as appropriate to the location and time. 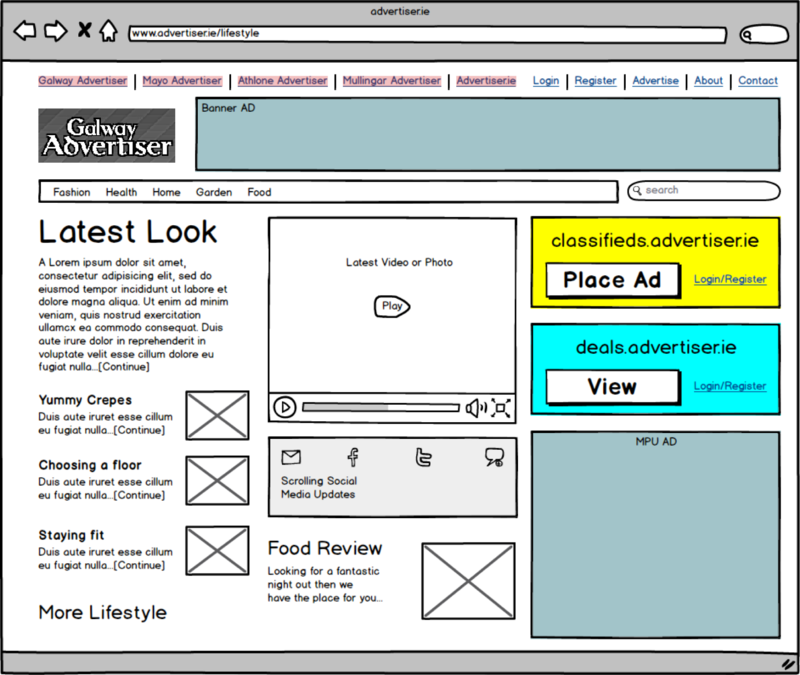 development of their Classifieds website. 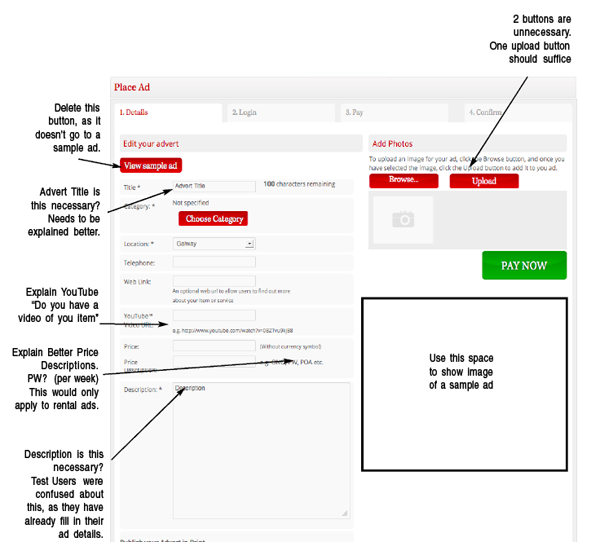 We identified important metrics to track, for example ads placed as a percentage of visitors. 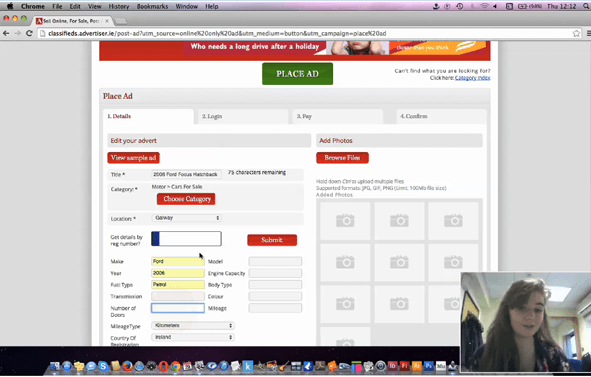 Next we created key tasks for our test subjects, such as placing an ad, or finding a specific item for sale. We arranged 4 students for one hour each as our testers. It was important they were unfamiliar with the site and therefore unbiased. Finally we did a test run in-house to check the screen recording software and finalise our script. All four testers did not use the 'Reg Input' field. 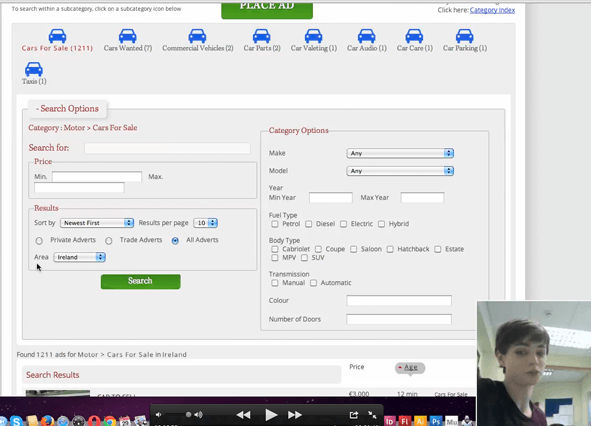 This video shows how all 4 users missed the vehicle registration auto complete when placing a car for sale ad. 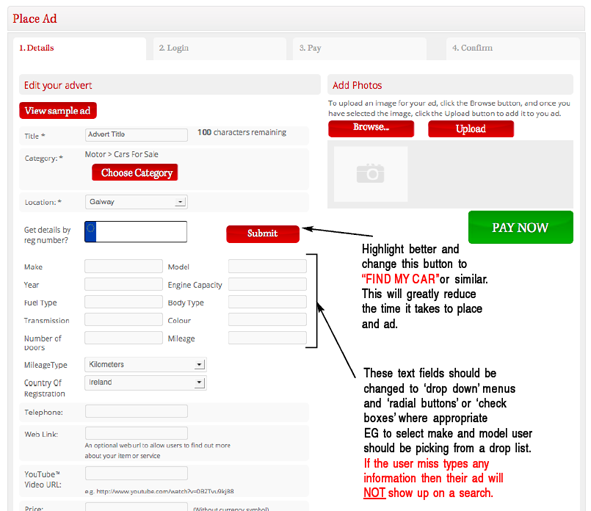 The button next to this field is labeled ‘SUBMIT’ and afterwards the testers said they ignored this as they thought it referred to ‘submitting’ the finished ad. 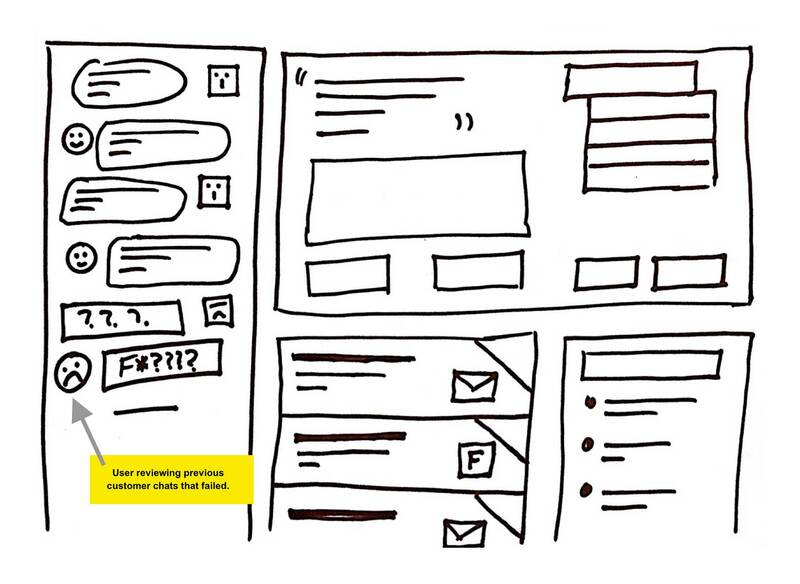 The study gave us a great insight into the processes and problems a typical user encounters. Areas thought to be working well, were found to be complete blinds spots, and not at all intuitive. 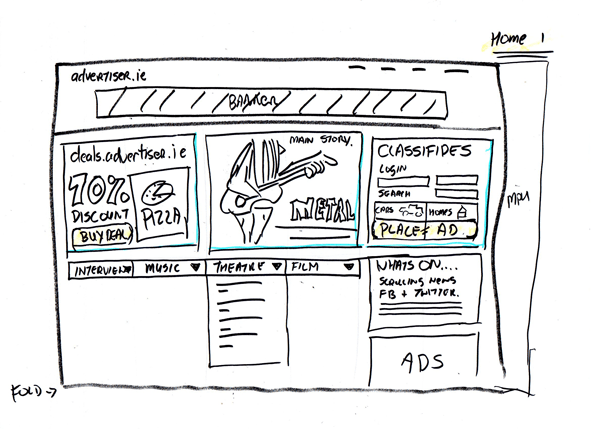 input fields, menus and visual layout. As well as the over all site structure. Following this I went on to mock up several revisions of the problem sections, showing how an alternative design might improve the user flow and overall experience. 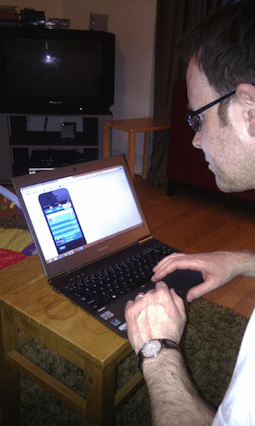 In November 2014 I took part in the first ever Galway Startup Weekend. The weekend involved pitching ideas and forming teams of Designers, Programmers, and Business Developers. Over the next 3 days each teamwent on to, develop validate and present their start-up ideas. 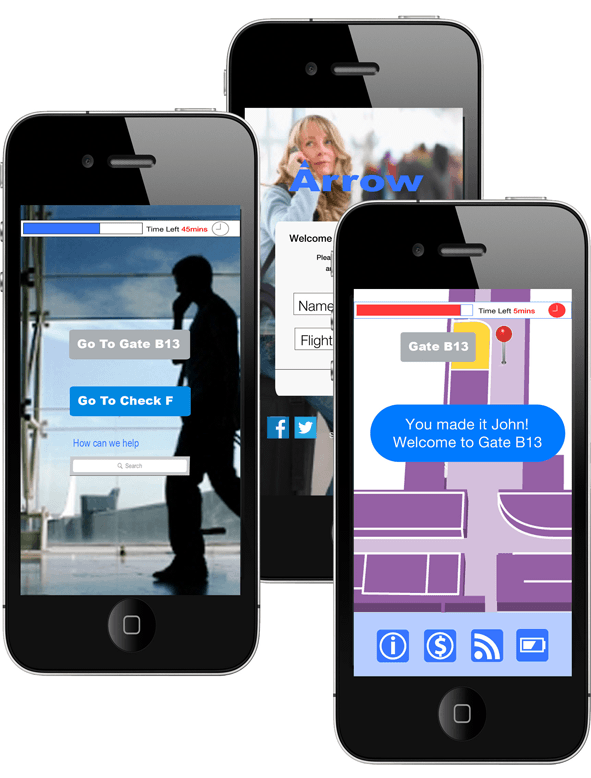 Arrow is an App designed to help travellers navigate through airports, by using their flight information and locator technology. Arrow will guide them to their gate, and other facilities, while also keeping them up to date with realtime flight information. 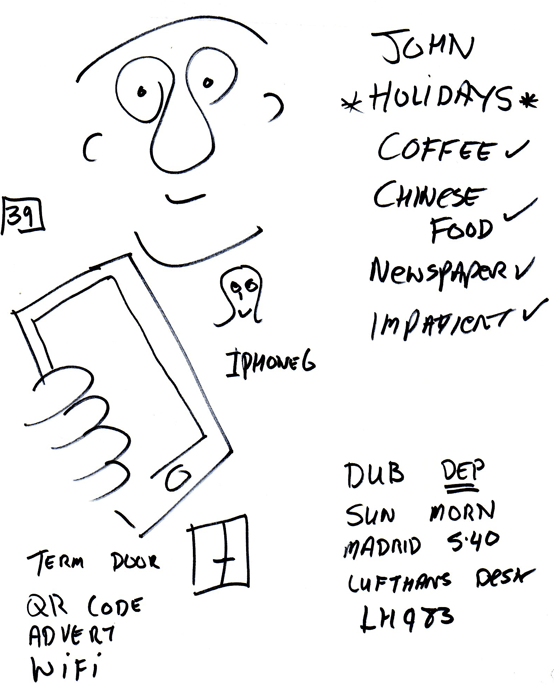 We created a Proto-Persona called ‘John’ based on a typical business traveller who might use the App. 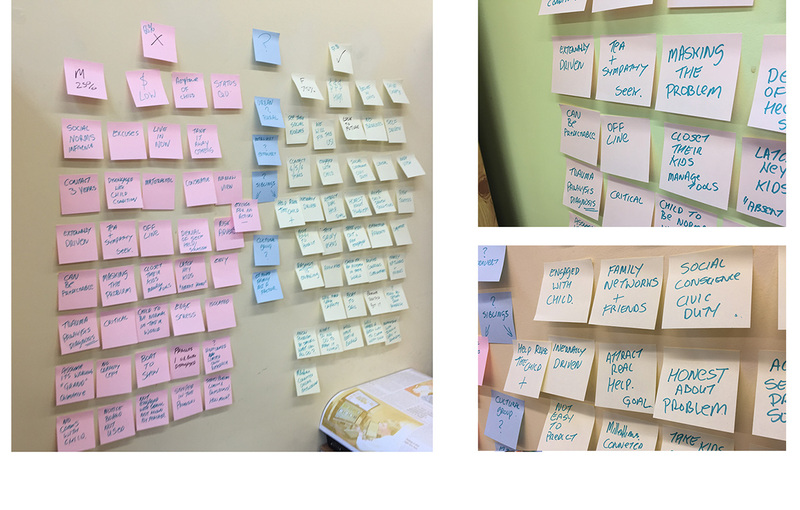 The Persona focused our team on the user over the weekend. I sketched a walk-thru of a typical journey ‘John’ might undertake to his gate, stopping at shops, restaurants and other amenities along the way. Over the weekend we also validated our idea with research and contacts made in the Airline and Airport businesses. 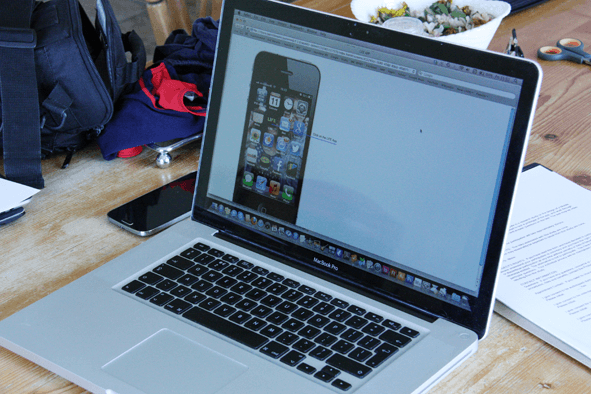 Using InVision we then took our concept and created a working prototype to present at the final pitches. This allowed us to work through any sticking points and finally showcase a clear vision of how our product could work in the real world. You can view our prototype here. 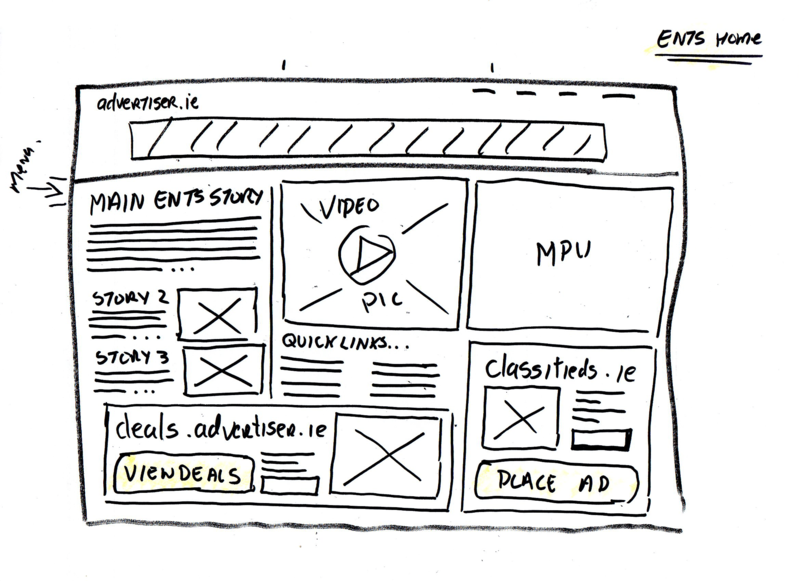 Planit Daily - Concept product allowing a user to consume news one story at a time, via metered payments. 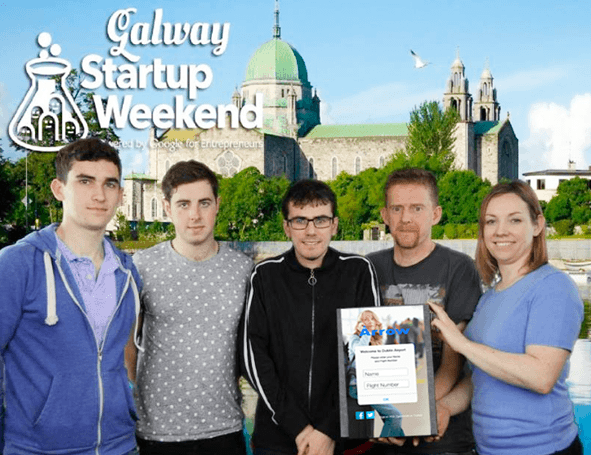 Galway Startup Weekend - Helping travellers to navigate airports based on their flight information. 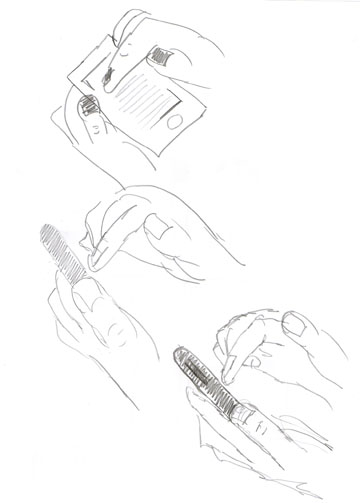 Quick sketches and rapid prototyping. 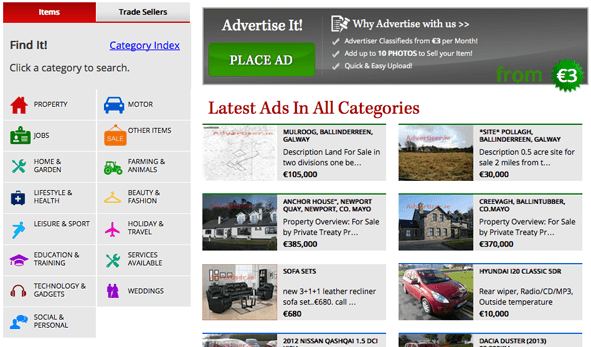 www.classifieds.advertiser.ie you can see the results here. 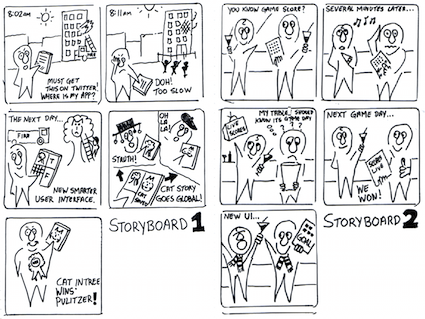 My storyboard and LiFE - Concept for a Social Media management tool. 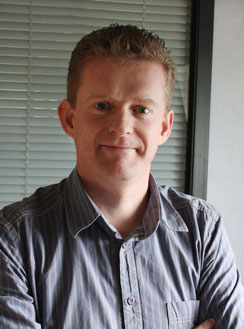 Originally I studied Visual Design, and I have worked extensively in Media and Publishing. 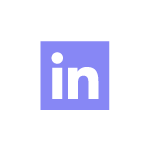 Currently I am the lead UX designer for a new product within the Genesys, Artificial Intelligence Group. 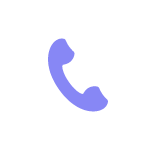 The Dialog Engine, allows companies to build their own chatbots, handling their customer queries reducing the workload within their call service centres. As we went along it was important that I up-skilled my knowledge of AI, Machine Learning, Data Science and Chatbot technologies. 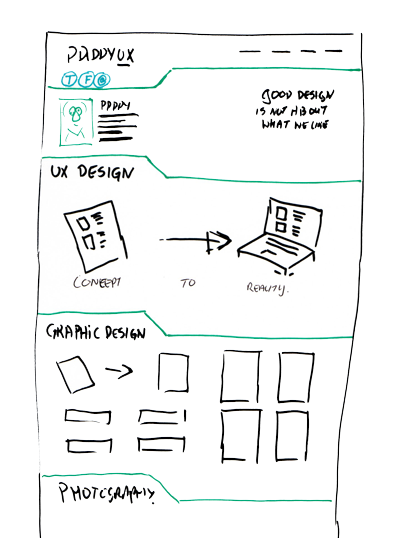 If I was going to advocate for a user centered approach, I had to be able to communicate effectively within the team. 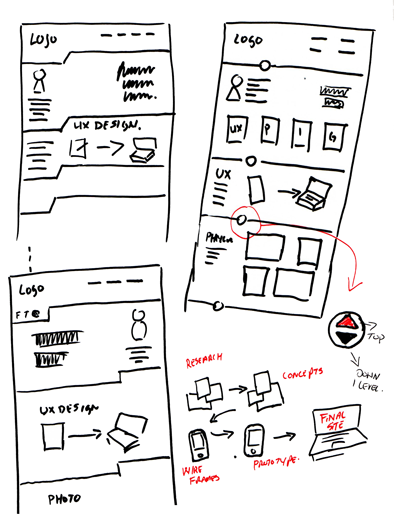 UX is not accounted for in the strict Agile process, and I had to promote and establish its value to our development cycle. How AI handles a conversation differs vastly from how we humans do. The subtleties of language, the pauses and inflections we use, are not easily understood by AI. Humans are also much better at switching context, whilst remembering the detail of different topics. We had to keep in mind that while a human will be using our product to author conversations, only one side of these conversations will be another human. 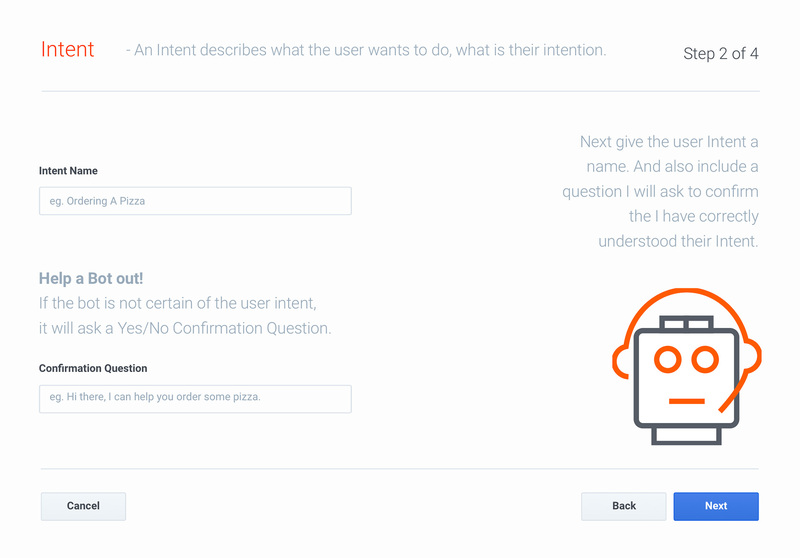 When building Chatbots, the user has to deconstruct the dialog and tag words, allowing the AI to pick up the context and intent. 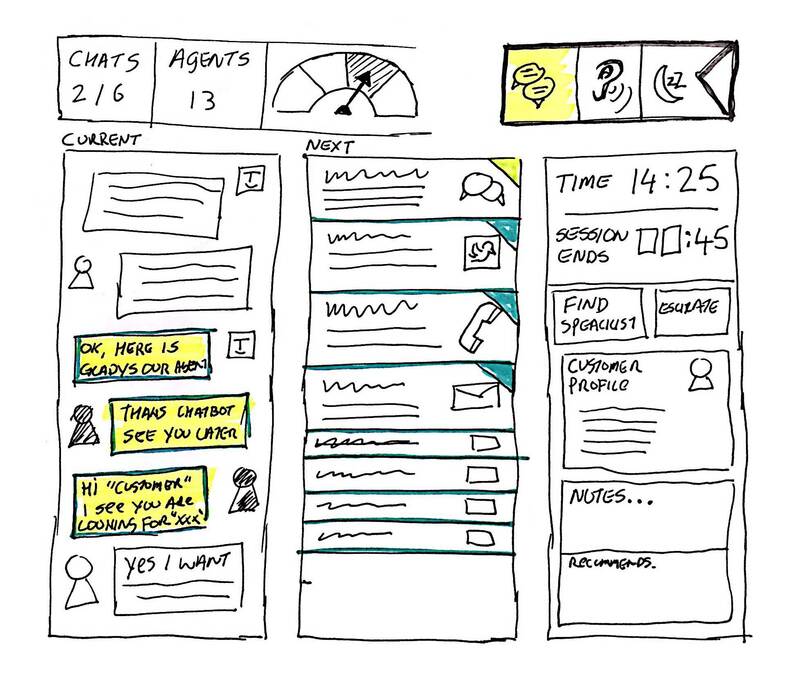 The challenge was creating an interface that matched the user expectations along with the AI capabilities. 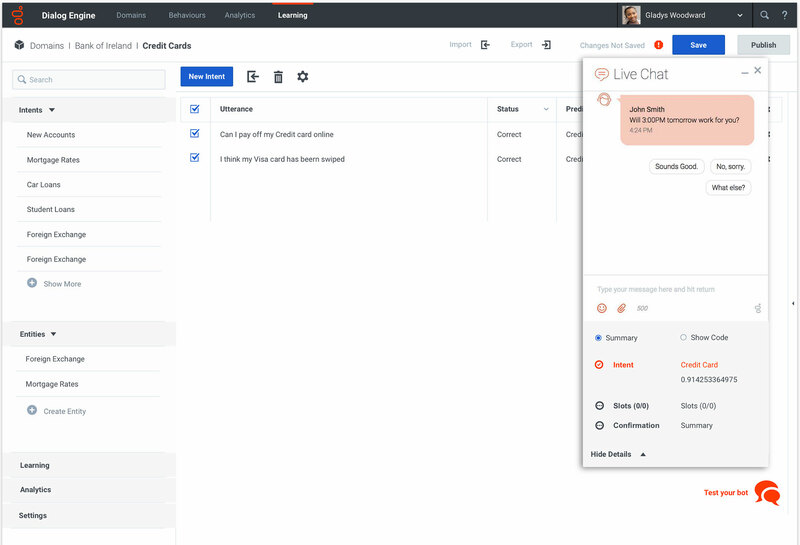 Customers want to create dialogues quickly matching how an end user would speak. Once we had our first version of the working UI, we organised demonstrations to our sales team, professional services and most importantly our customer base. This process gave us valuable input to the future road map. I also probed these meetings to get more detail on who the user would be. As we shared the demos with more people, it became apparent that the concept of authoring conversation for chatbots had to follow closer to how the user understood this. And along they way we had to help them tag the conversation elements for the bot. And also explain why this was required. First up we needed to get a solid understanding of our users, we couldn’t allow the product to get too far ahead without user input. I decided to undertake some wider research, looking at what both consumers and business expected from chatbots. I also did a comprehensive study of the other solutions in the market. 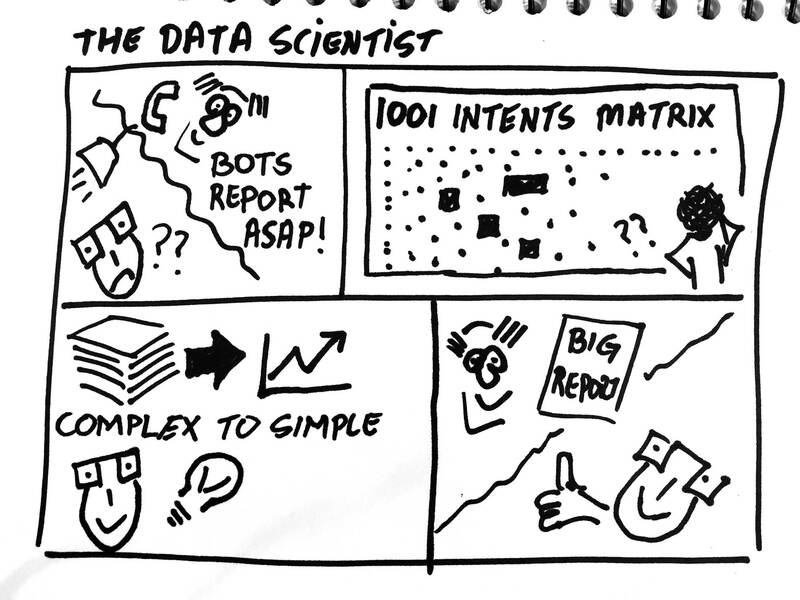 - To understand what large global companies wanted a Chatbot builder to do. - Get to know the typical user, their role, and technical understanding, as well as the goals and motivations they had. - Know the value this product could add, and how it integrated with other services, such as online banking. 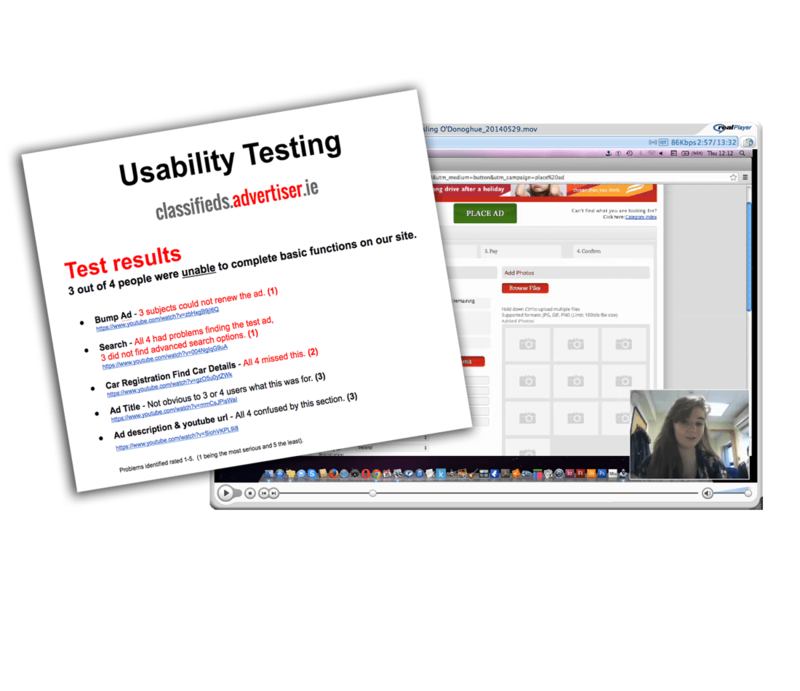 This was one of those products that was difficult to reach an actual end user for testing. I decided to do some guerrilla testing in the office. For two main reasons, firstly we had some divergence within the team on how the main screens should flow. My recordings of users struggling gave weight to the case for required changes. 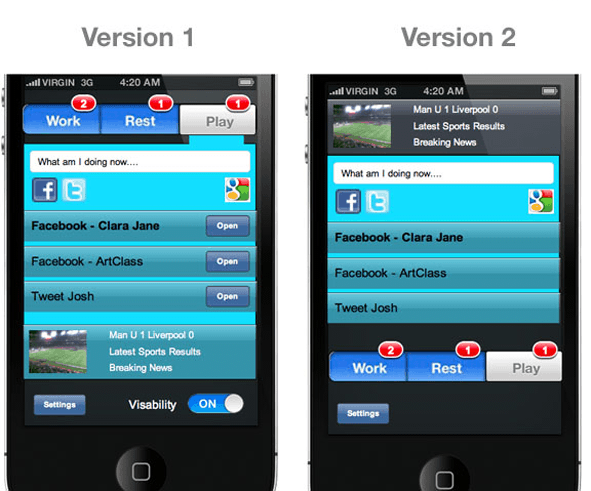 Secondly, there are always going to be usability problems that we are no longer seeing due to familiarity. The testing really corrected our course in terms of the layout, screen flow and some labelling, which really improved the experience. 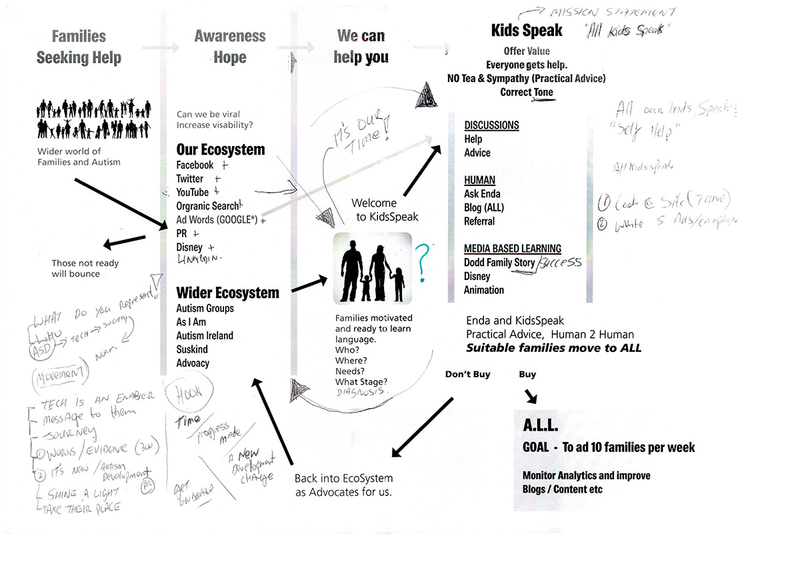 The Dodd’s have built an online platform which helps non-verbal Autistic kids learn to speak. Enda and I spoke at length about his twin boys and the family’s journey from a diagnosis of severe Autism, to the amazing young men who now programme alongside him every day. I came in to help them tell their story, and to identify and reach as many new families as possible. The Eco-System. Who are our Users? To grow we have two main areas of focus, (1) customer identification and (2) telling the family story. Enda’s experience of talking with families had given him some great insights as to why some parents don’t act to help their child. We decided to explore this and we built a Persona to help us focus on these people. I began with posing a series of questions for Enda. I wanted him to think about the ideal families currently on the program, and also those that although suitable, didn’t engage with him. Along with our Google Analytics we were able to clearly identify the types of parents we needed to reach. I began with a detailed study of the entire site recording each Heuristic violation, and rating them in terms of severity. This gave us a shared understanding of the required fixes and their priority. A major issue we resolved was form abandonment. 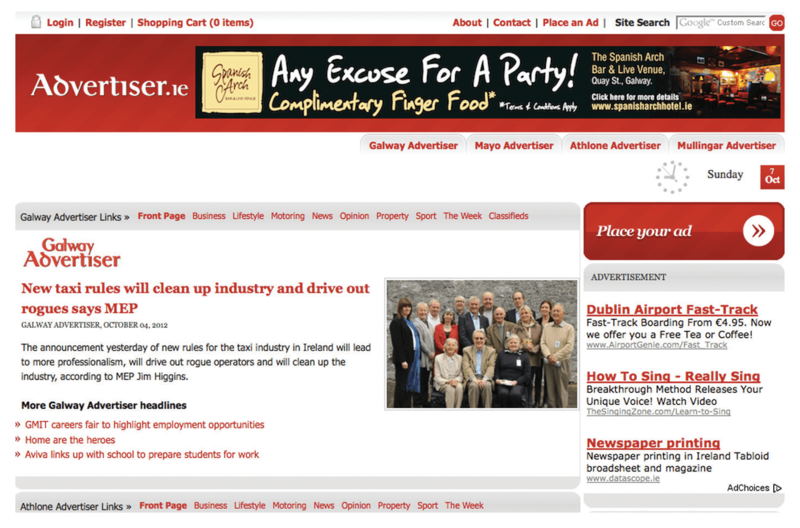 Enda’s main goal is getting visitors to fill in the contact form. In the original process users went into a shopping cart track. 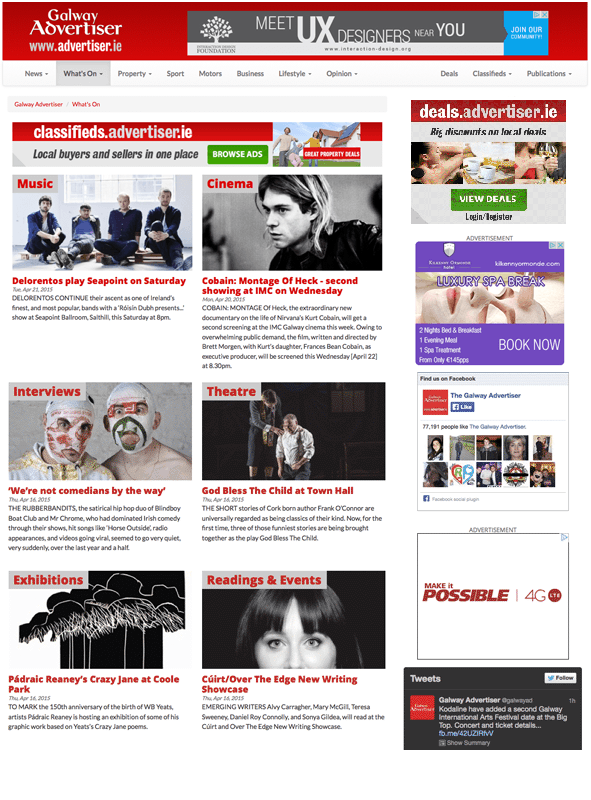 We moved this and made it more accessible, and this dramatically increased our submissions. Conor and Eoin’s story is very compelling, and one of the key factors, is that their success is obtainable for other families. However while going through the website I felt the language used was hitting the wrong note. The Dodd family story was getting lost in a lot of medical and technical language. 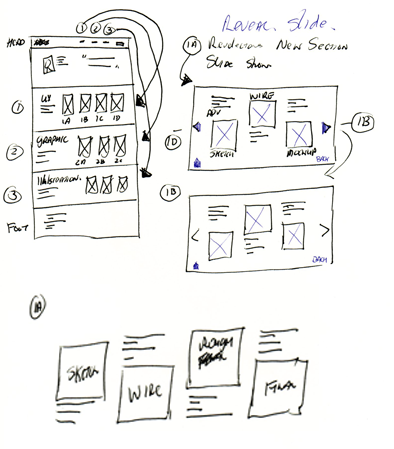 So we began a process of rewriting and redesigning each section. Conor and Eoin are the single best validation of Enda’s software. We want families to look at this story, and be motivated to join the program and see their own children grow and develop. 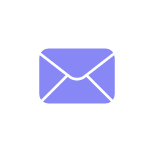 Covering - Project Management, UX Design, Leadership and Management, Product Design and Lean Methodologies. For my final project I pitched an idea for the entrepreneur track. 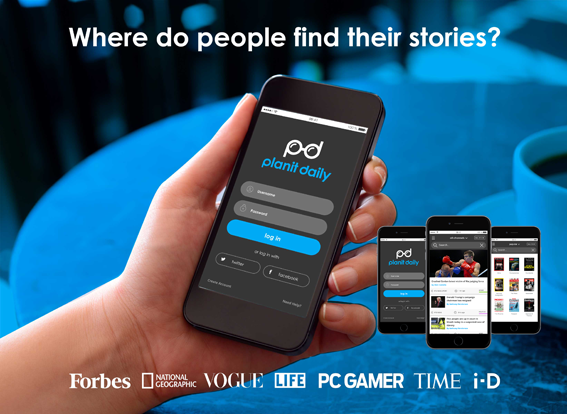 PlanitDaily is a product that allows users to read news articles, paying for them individually, rather than subscribing to each publication. To identify our customers and what they might looking, we 'got out of the building'. 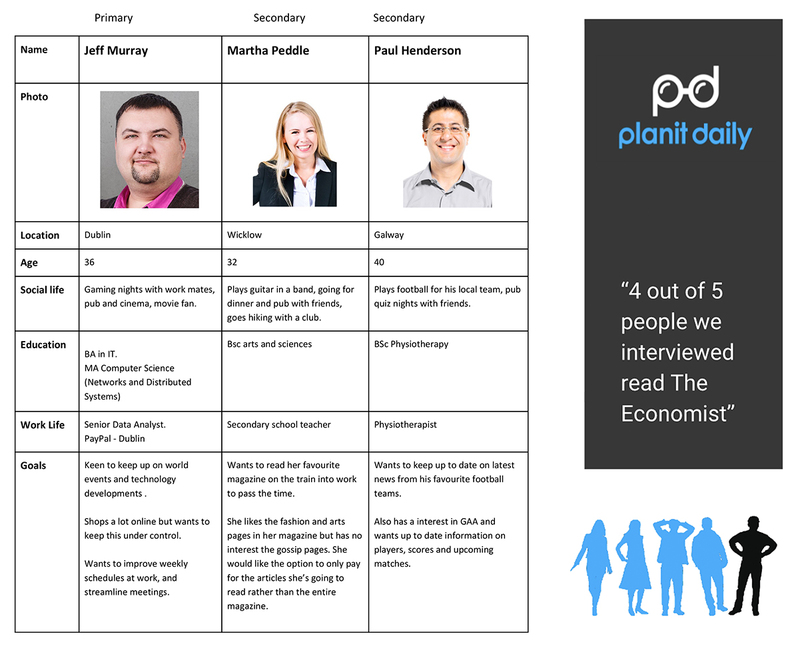 We conducted face to face interviews asking people about their media habits and preferences. We wanted to know what they read and why, also we explored their levels of trust in different media brands. We developed several personas based on this, with some common themes emerging such as a willingness to pay something for good content. A healthy skepticism of content from certain sources. 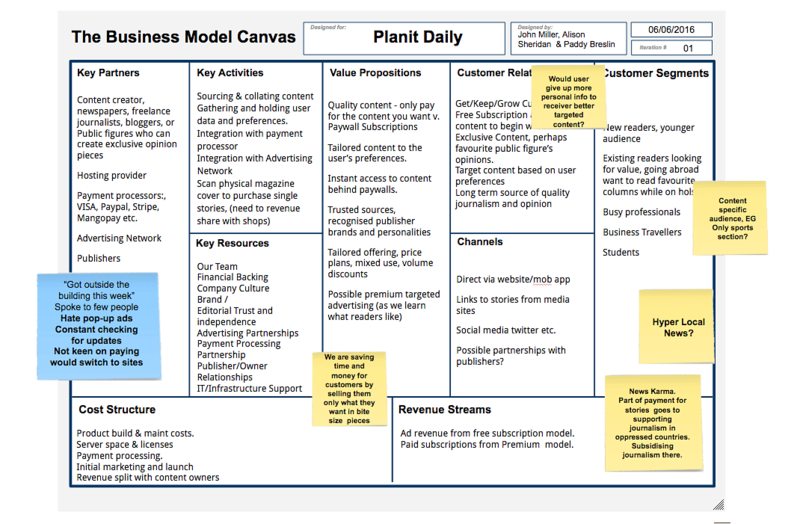 To explore our concept we used the The Business Model Canvas. It drove us to validate the idea against customer and business needs. The canvas evolved over the project's life, and it helped us focus on the wider concept, as well as getting down to building a product. The problem: Connecting the publisher and the reader. 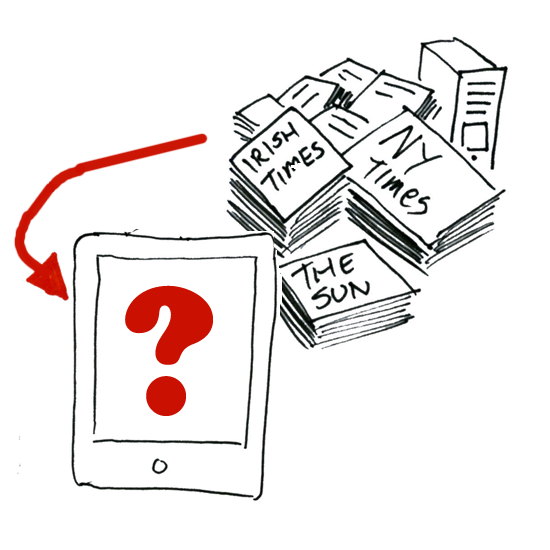 • Publishers are struggling to monetise their News content. 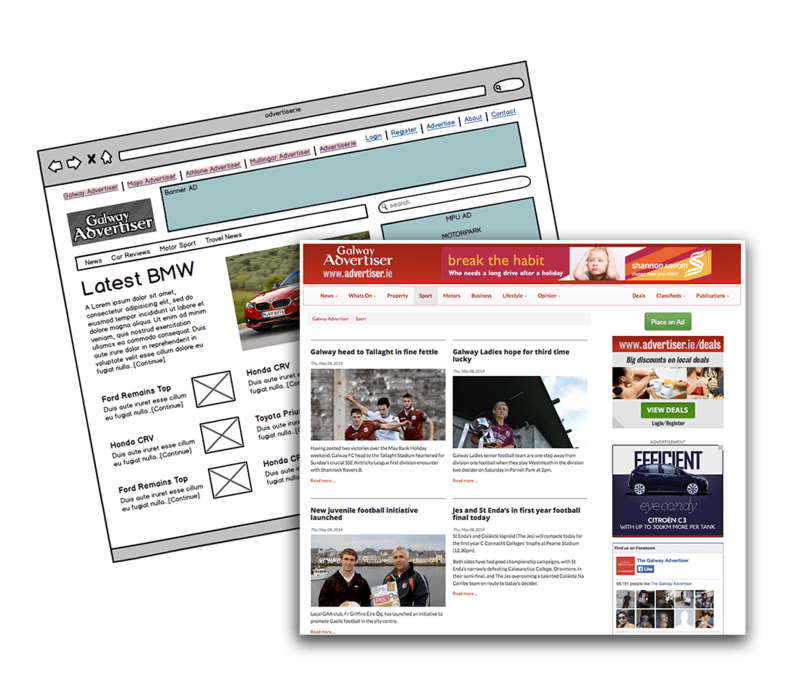 • Readers can't easily access content behind paywalls. For our final presentation video we wanted to show our journey, and the key decision points along the way. 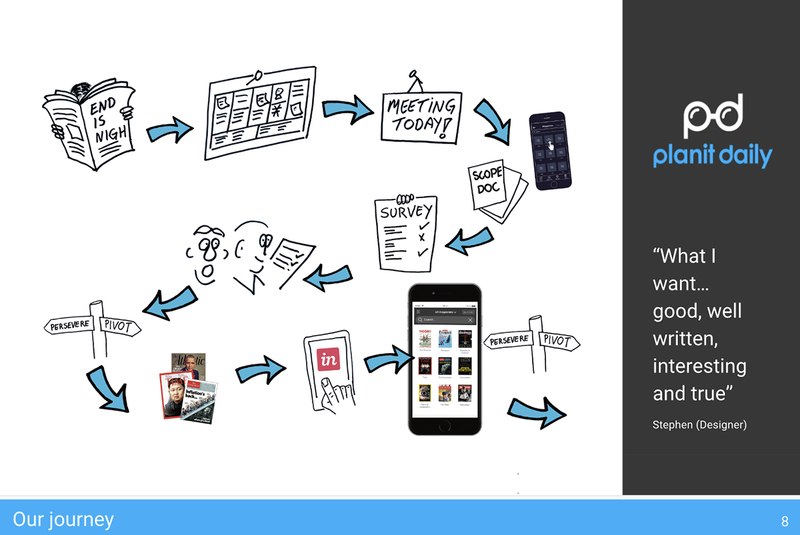 We wanted to demonstrate how our own perceptions changed, how the discovery process showed us a truer picture of what users and media owners wanted. This helped shaped our progress and pivots. 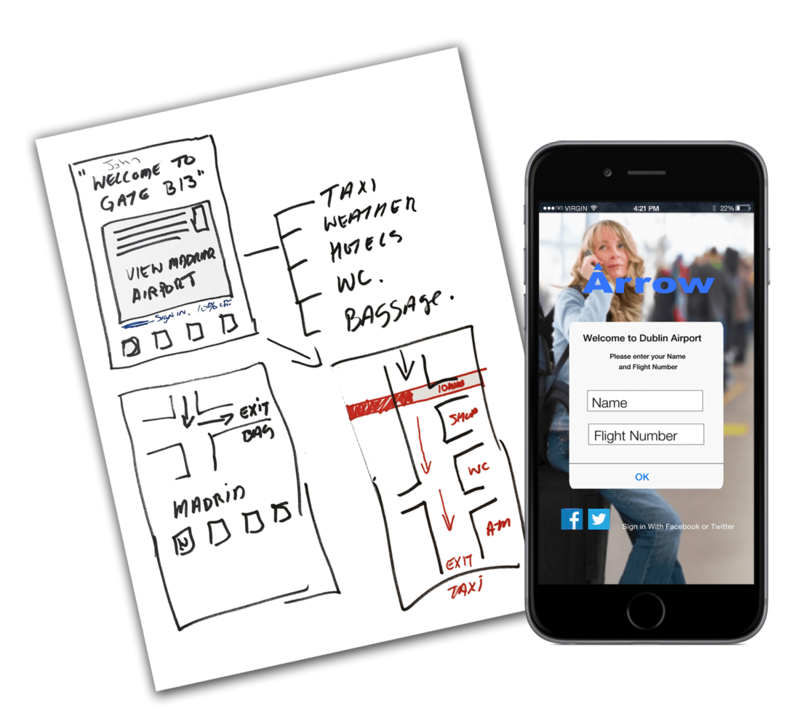 Over the 3 days we took the initial idea and built a working prototype, showing a typical user from arriving at the airport, to finding a restaurant and onwards to their correct departure gate. We looked into other aspects including the technical side of actually getting this to work within and airport terminal. 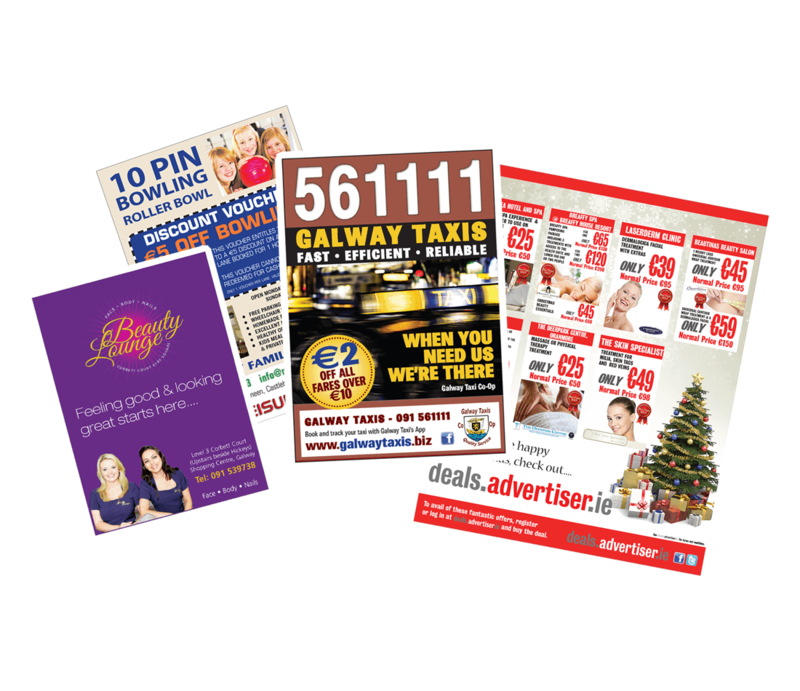 And also considered revenue streams from retails shop, who could live target offers to travellers on route past their door. Our team did a super job, and finished second. Getting solid praise from the judges, for having a working prototype built, and considering the overall use case. 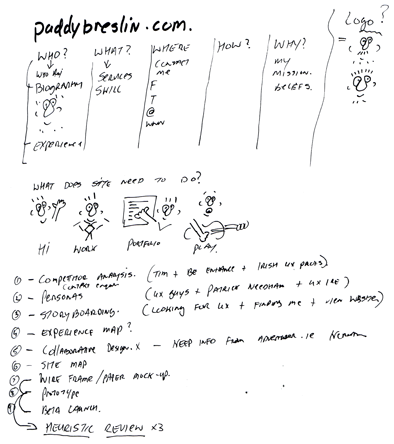 We took time to brain storm a typical frequent airport user, and from this created our proto-persona, John. 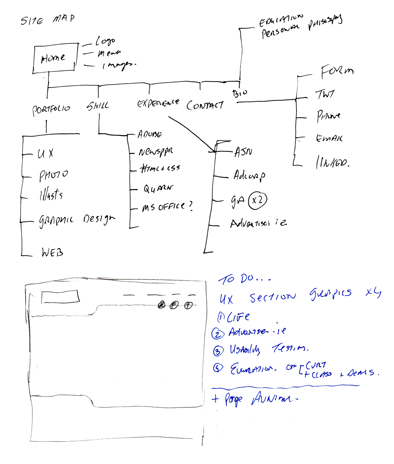 It was important that we had a user focus to our project, and this gave us a great framework to work out the details of the product, market, fit. It a also was the basis for our working prototype, taking John's typical business trip to a new airport, and the sort of facilities and services he might seek while there. The Who? What? Where? How? Why? 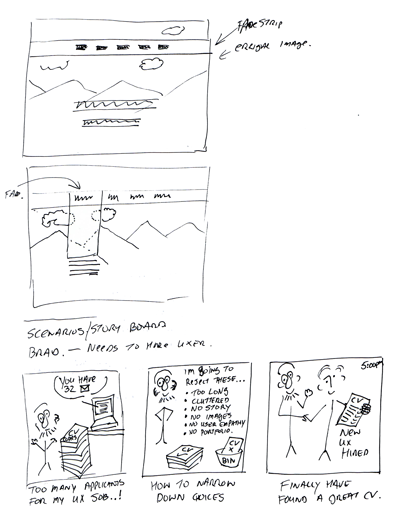 Story board to focus on what recruiters look for. Working out site structure and sections. 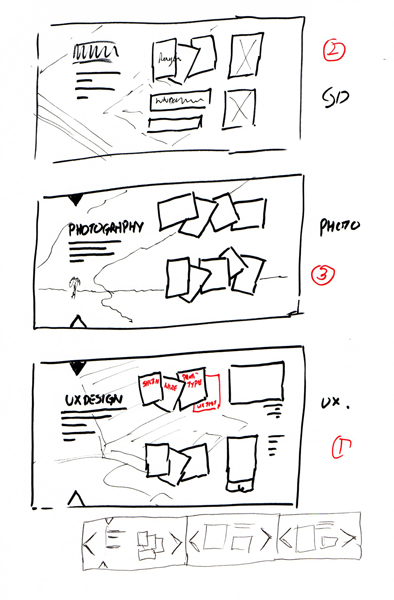 And some initial concepts for visual layout. 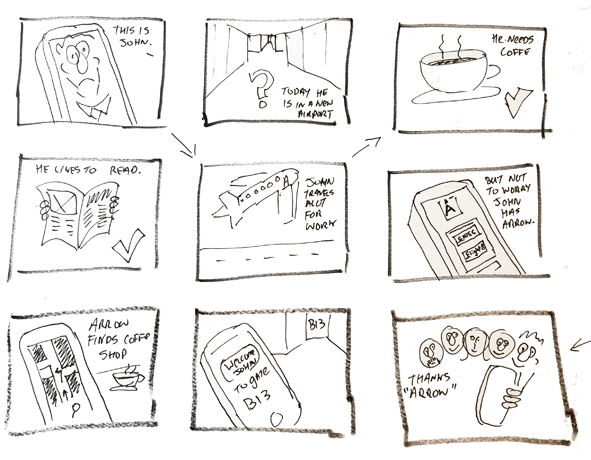 Refining the storytelling process for my work. Developing the final sections and content. Recently somebody asked me if I had a pen...?